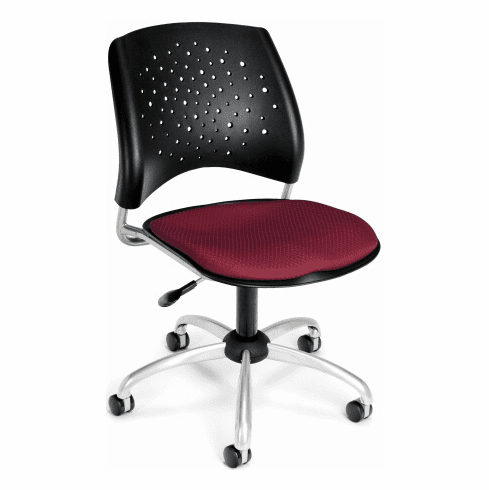 OFM Stars Series Modern Task Chair with Small Seat  Free Shipping! This contemporary task chair from OFM features a contoured, triple curve padded seat cushion upholstered in your choice of (16) different stain resistant fabric's. Other features include curved backrest with built in lumbar support and ventilation holes, removable seat cushion for easy cleaning, 360-degree swivel, pneumatic seat height adjustment and a five star angled spider base with dual wheel casters. Optional height adjustable T-shape arms available for a minimal charge. Meets or exceeds ANSI/BIFMA standards. Dimensions: Seat Size: 18.5"W x 17.5"D. Back Size: 19"W x 16"H. Seat Height Adjustment: 17 -21"H. Overall: 34 -37.5"H x 22"W x 22.5"D. Limited lifetime warranty from OFM. This task chair normally ships in 1-2 business days from our NC warehouse.